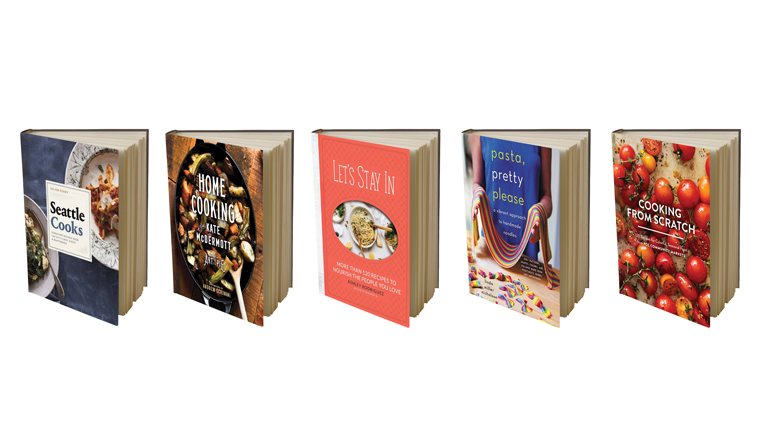 If you’ve ever wanted a compilation of recipes for the city’s best dishes, here’s your chance. Seattle-based food and lifestyle writer (and former Seattle magazine food editor) Julien Perry has pulled together 80 recipes—from Jerry Traunfeld’s eggplant fries to Tom Douglas’ crab cakes—in this cookbook published last month, the latest in a series that covers cities from Portland to Toronto. Although PCC is celebrating 65 years, the local, community-owned group of food markets has never before released a cookbook. This book, released in September, gives customers access to fan-favorite recipes from the PCC deli, such as the Emerald City and Perfect Protein salads. It’s been nearly 10 years since Ballard-based Ashley Rodriguez launched her award-winning food blog Not Without Salt. Her brand has grown to include cookie mixes and artisanal salt, cooking classes, a web series and, now, her second cookbook. The first was an ode to date nights at home with her husband; this one focuses more on Rodriguez’s style of effortless hospitality and inviting meals to share with loved ones. The local reigning Queen of Pie is back after her celebrated 2016 release, Art of the Pie: A Practical Guide to Homemade Crusts, Fillings, and Life. This follow-up book is decidedly savorier. Consider this a guide to staple recipes—such as roasted chicken and basic baked goods, like McDermott’s favorite scones—for the everyday cook who has little time and is looking for recipes with unfussy ingredients. A good graduation or wedding present, perhaps? If you haven’t been following this eccentric Instagram star, you’ve been sorely missing out. Nicholson’s colorful, all-natural pasta creations—rainbow-hued spaghetti, flower-print ravioli—are the stuff of dreams. Her story has been picked up extensively by national food media over the past couple of years, and this cookbook is a culmination of her efforts, with stunning photos and how-tos for making her unreal creations at home (she swears it’s not as hard as it looks).